Kill the weeds, not the lawn. 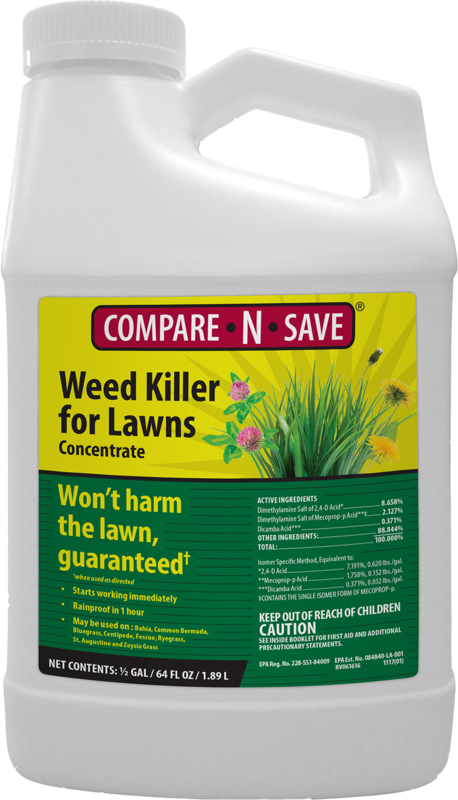 Compare-N-Save Weed Killer for Lawns Concentrate eliminates unwanted weeds that stand between you and a beautiful lawn, without harming your grass. Fast acting, this product starts working immediately and is rainproof in one hour. It controls common weeds like dandelion, chickweed and lambsquarter, along with stubborn lawn weeds like creeping Jenny and ground ivy. For a full list of targeted species and spraying instructions, please see the COMPLETE LABEL. Compare-N-Save Weed Killer for Lawns is ideal to treat all types of lawns throughout the growing season. It can be used as both a spot treatment and to treat an entire lawn. Compare-N-Save Quick Acting Weed & Grass Killer SHOULD NOT BE USED for controlling weeds in flower or vegetable beds or around shrubs or ornamental plantings. Do not spray on grasses where desirable clovers are present. For best results, spray during the season when weeds are actively growing. Apply when air temperatures are cooler than 90F. Refrain from watering for 24 hours and mowing for at least two days. On new lawns, it’s best to wait until grass is at least two inches tall before applying an overall spray treatment, although spot treatments may be made at any time with a small pressure sprayer. Do not exceed two applications per year and wait a minimum of 30 days between applications. Using a pressure or trigger sprayer, mix 4 fluid ounces of product per gallon of water to treat 1,000 square feet of cool season grasses. For warm season grasses, mix 2 fluid ounces of product per gallon of water to treat 1,000 square feet. Adjust the spray nozzle for coarse spraying and aim at the center of the weed, spraying to wet. Visible wilting will appear after a few days. Do not use a hose-end sprayer for spot treatment. Use a hose-end sprayer designated for lawn use. For cool season grasses, mix 4 fluid ounces of product with 1 gallon of water in the container to spray 1,000 square feet. Mix 2 fluid ounces with 1 gallon of water for warm season grasses. For larger areas, increase the container mix of product and water to the desired level of coverage. For example, to spray 2,500 square feet of cool season grasses, mix 10 fluid ounces in the container and add water to the 2.5 gallon level. Turn on the garden hose and spray as evenly as possible. Do not apply to newly seeded grasses until they have been mowed 3 times. Do not reseed for 3 to 4 weeks after use. Do not apply as a fine mist due to potential injury to desirable plants. Do not apply if rainfall is expected within 24 hours. It is a violation of federal law to use this product in a manner inconsistent with its labeling. Read the entire label before each use. Use strictly in accordance with label precautionary statements and directions. See the COMPLETE LABEL for specific use rates and detailed instructions. Consult the SAFETY DATA SHEET (SDS) for important safety information. Not all stores carry all Compare-N-Save products. To be sure, call your nearest store or search their website online for reference.